This entry was posted in Campus Announcement, Libraries and tagged Auburn University Libraries on March 29, 2013 by Wire Eagle. AUBURN UNIVERSITY – The Auburn University Libraries has produced a digital collection of school catalogs dating from 1860-1904. It includes catalogs from the East Alabama Male College, the Agricultural and Mechanical College of Alabama and the Alabama Polytechnic Institute – predecessors of Auburn University. In addition to course information, the catalogs list names of faculty members and students, admissions criteria, expected costs, graduates, board members, rules of conduct and images of life on campus. 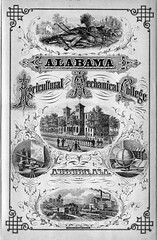 The 1860 East Alabama Male College catalog shows that Auburn had 101 students and only six faculty members, including two mathematics professors, professors of Greek and Latin and professors of moral science and natural science. By 1904 the Alabama Polytechnic Institute had grown to 425 students and 34 faculty members, including five engineering teachers, three agriculture teachers and two veterinary science teachers. These changes over a period of almost 45 years reflect in part a shift in the nature of Auburn from a church-related liberal arts college to a state land grant school under the Morrill Act of 1862 that focused on agriculture, engineering and practical education. The Auburn University Historic Catalogs Collection is a project of Special Collections and Archives in cooperation with the Systems Department. The collection can be found in the Auburn University Digital Library at http://diglib.auburn.edu/collections/historiccatalogs/. The Auburn University Digital Library is a specialized unit of the Auburn University Libraries. Based in the Ralph Brown Draughon Library, it draws on a variety of collections – including the holdings of Auburn University’s Special Collections and Archives Department – and makes them available to educators and students in Alabama and beyond. To view more digital collections, go to the website at http://diglib.auburn.edu/index.php.